From 23th September to 13th November 2016, an exhibition will take place in Rome to celebrate the 300th anniversary of the Non-Catholic Cemetery. "The most beautiful and solemn cemetery I have ever beheld." 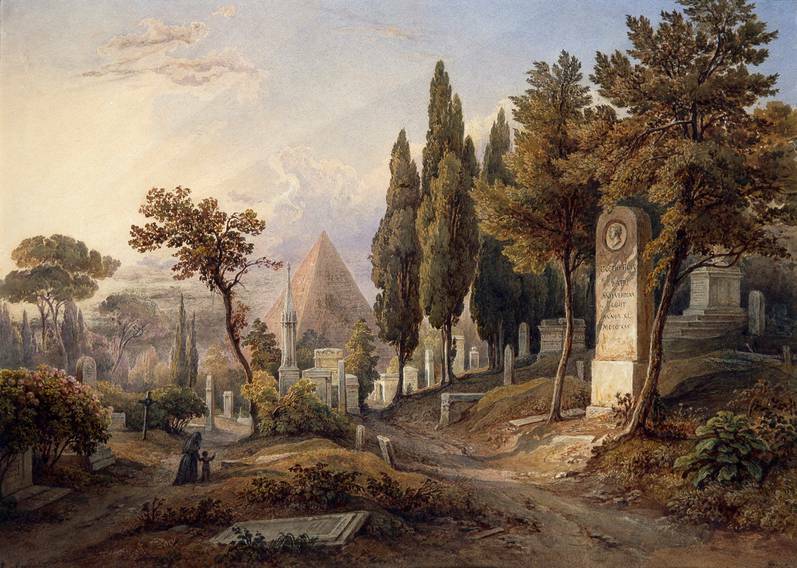 declared the poet Percy Bysshe Shelley about the Non-Catholic Cemetery for Foreigners in Rome. Since the height of the Grand Tour, non-Catholic foreigners dying in Rome have been buried in front of the pyramid-tomb of Caius Cestius. In 2016 the Protestant Cemetery (now officially the Non-Catholic Cemetery for Foreigners) in Rome will celebrate its 300th anniversary. For this occasion the Cemetery, in partnership with the Casa di Goethe, has planned an exhibition of paintings, drawings and prints from the 18th to early 20th centuries to illustrate the history of this place dedicated to citizens of Protestant faith who died in papal Rome. The exhibition will take place from 23th September to 13th November 2016 in Casa di Goethe (Via del Corso 18, Rome, Italy) near the Piazza del Popolo. For more information visit the website www.cemeteryrome.it or www.casadigoethe.it.